Uncertainty is bad for business. Few people thrive when they are feeling nervous and insecure. Most of us work best when we have a clear picture of where our organization is heading and what we need to do to contribute. Please join us for a working session exploring how to leverage SnapComms for your major change communications - we'll look at employee communications best practice as well as specific examples that will cut through. Paula: Hello, this is Paula Cassin from SnapComms. 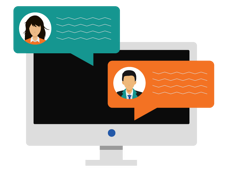 Thank you very much for joining us today for our administrator webinar, and our topic today is communicating major change with SnapComms. A little bit different from the previous ones, but really keen to get into this a bit. We're gonna talk a bit about Brexit as well, which I know effects a lot of our customers. So let's get started. First off, the team. I'll just introduce myself. I'm Paula Cassin. 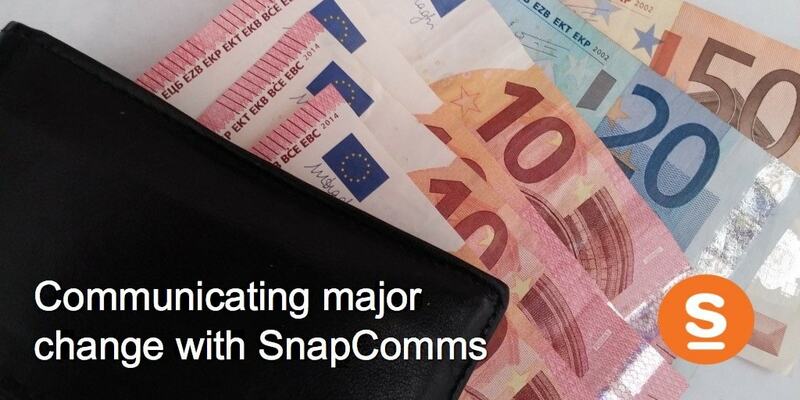 I've been working with SnapComms for many years, and customer success, best practice, that's my area of expertise. And I'm happy to have Susan with me today. Susan's gonna be chiming in. She's our head of content and knows quite a lot in the employee communications, internal comm space and is following Brexit closely. And Riya's here too. Riya's gonna be managing the questions. And you'll see, if you go to meeting panel, that there's a questions area where you can pose a question, let us know if you have any issues. So, hoping to get some questions through from you. All right. So, that's who is gonna be talking today. SnapComms, in case you're not familiar with us as a company, we're an enterprise software company and we have customers all over the world. We really do. And over 1.3 million users so far on the platform, getting visual messages from their organizations. Yeah, and support service. That's really one of our differentiators. We're very keen to make sure that our customers are successful with what they use from us. And let's meet you. I wanted to ask you...now, I'm gonna ask this question and hopefully, you can just type in your answer to the questions area. In terms of major change, our topic today, what are changes that you're facing? What are you facing that you need to communicate in your company? I'd love to know. Just give us a bit of background so we can make sure we tailor this right for you. Okay, and I'm getting a few answers through. I see one person says, "We've just been through a spinoff and a merger and have to communicate." Someone else said, "Safety protocols need to be sent out." Okay, another merger acquisition. Okay, I don't see anybody saying Brexit, but hopefully that's okay. We're gonna use Brexit just as an example. But that's wonderful. Thank you for a little bit of feedback there on what topics you're currently facing so we can make sure we address them. And our goals here today. We want it to be a working session, we want to give you some ideas that you can use right away. We don't want it to be all theoretical or high level. So hopefully, we'll achieve that today with the content we have. You'll have to let us know at the end. Okay. Now, let's get into it. In terms of our agenda today, we're gonna go through four main articles. First...yeah, items, articles. I just said articles. We're gonna go through what do we mean by major change, what does that look like, and what it...Brexit, how does it have those characteristics? And then we'll get into the meat of it. The meat of it is the last two sections which is, for your communications, your change communications, what do you really need? What's critical? And then scenarios. Scenarios using SnapComms. In these kind of situations, how can you use our messages to really take it to that next level and just sort of hit that home run? All right? So, what is major change? Let's start with that. Okay, major change, it's gonna be something that impacts most of your organization. There's some change, of course, that's gonna be big for one division or one location or one type of job, but really, we're talking about huge things here that are gonna impact most of your employees in one or two ways. Either there's a risk that their engagement or their productivity's gonna drop because of some scenario. We really want to keep them tight and happy and motivated, doing their best work. Or maybe there's something that actually changes what they do. They're here, we have a new system that they have to use, there's a new protocol, a new compliance process, whatever that might be. So that's sort of the way we generally define it. And really, it's a situation where your communications have to be consistent, coordinated, timely...oh, my goodness, that's...those are...you might say that about everything but have a look at this list. Merger acquisitions, spinoffs. I'm just glad to hear some of you mention that. We've seen it lately just in town. We're using Go to Webinar as our platform and Citrics Online which runs Go to Webinar. They're based near me in Santa Barbara. Citrics spun them off and they're just finishing up that process which has taken about a year. So we're watching that one closely. And, of course, merger, acquisition, you've got LinkedIn being bought by Microsoft. Part of LinkedIn is right down here near us too. Gosh, these things are happening all the time. And major change can be really great. It can be positive. A lot of times, though, it's negative. It's worry and stress for employees. And speaking of that, Brexit. This is the example we thought we might get into to look a little bit further at major change. And Brexit, wow. It's the Ben Hur of major change, I'd say, if you do any sort of business in the UK or with Europe. So much is being affected. And this is a picture from Ben Hur. I'm older. If you are young, you may not know what I'm talking about when I say Ben Hur, so I'll just take a second to explain. Ben Hur was a movie that came out, oh, gosh, in the '50s, I think. It was the most massive production and the massive amount of money and people and resources that have ever been put together for a film before. It's an epic proportion film. And this here, this is an actual set. Those are real people. It's not CGI. This is before CGI. Those are real soldiers and there's a real chariot race going around this real arena. And Brexit's a bit like that because...goodness. If you have an office in the UK, you probably have a lot of employees that are European Union citizens, not British citizens. What's gonna happen to them? And if you have European offices, what about the British folks that are in your offices over there? What's gonna happen to them? And then you've got the whole thing with taxation and customers and processes. And I'm not gonna read this whole list but anyone who does business in the UK and Europe in general, they're gonna be impacted by this. So much has to change. And when we look at that kind of change, even on a smaller scale, what do employees...what do they want to know? What do you want to know as an employee when you look at this kind of thing? Well, what does that mean? Is my job safe? Oh, my gosh, what's gonna happen? Oh, do I still have a job? Am I gonna do something differently, right? You sort of start with that. How does this effect me? How does this effect me? And then you work down from there, sort of going more lively. And with most major change initiatives it takes a while before the organization knows the answer, especially in this case. This one's probably extreme, where we know that Britain is gonna exit but we have no idea about timeline or details and what it will look like or what the rules will be instead of the European Union rules. You can see that with mergers and acquisitions too, normally. They announce those kind of things and it takes quite a while before you really know where's the overlap, what jobs are going to be consolidated or where are functions gonna be based. Are there double ups, and what's gonna happen and who wins, essentially? That's a bit brutal but that's the kind of thing with major change that's just fundamental. Okay, and then...now, this, Susan, I want to start talking to you, Susan, because I know you'd mentioned this in one of the articles. We have an article on our blog about Brexit and timeline communications for that. You mentioned that this is just an insane opportunity too, though. These kind of major change situations can be a communicator's dream in terms of the impact you can have on the organization and what you can do to make a difference in the organization. So, I wanted to ask you to talk a little bit about that. Susan: A real, great opportunity to really kind of step up and show just a value that good internal communications can bring to an organization. Paula: Very good. Great. And let me...when it comes to this...there's different phases with a major change situation, right? So, in this phase we've got where we are now, where we know what's gonna happen, but we don't know what the impact's gonna be. Then you get to a time when you know the details [inaudible 00:09:47] what's happening if it's an external situation? What's happening out there? You could start building the company response. And then phase three, that's when you know what's gonna change and you're really getting into making sure your employees are up to speed and able to adapt and change what they're doing. So, we're gonna come back to this in a little bit. Let's go into major change communications, what you'll need, and I just wanted to also [inaudible 00:10:22 to 00:10:24] to some of the responses you guys sent me. [inaudible 00:10:25] response from Brandon about [inaudible 00:10:29 to 00:10:31] with their company and they've got a lot to communicate with their teams. And [inaudible 00:10:35] merger and acquisitions in here, and major project launches is another one that I can see here too. And [inaudible 00:10:45] has a question, but that's a little bit different. I'm gonna go back to your question later, [inaudible 00:10:50]. Okay, just in terms of [inaudible 00:10:53] partners. So major change communications. Here's some of the key factors, and let's just get started with these. You need a good team. For these kinds of things, you want a team, you want to make sure everyone really understands the employee perspectives, and you want access to the people who are making the decisions. You don't want to just be a relay point where they send you through, they tell you what the decision is, go communicate this out. I think you want to be across the context and the process [inaudible 00:11:27] in order to make those decisions. And Susan, do you have anything to say about this one? Susan: I think this is really critical, actually, in terms of it's often easy just to have senior management involved in a critical team when something like this happens. But really, it's essential to have stakeholders from right across the business. So, those that are at the core phase of what's happening at every level, those who really have the trust and the ear of employees so that you actually get what the real issues are. I think that's critical, to actually have that good mix from every level of the organization. You don't want the team to be too large, though. I mean, you actually just want to stay agile and be able to get things done. So think carefully about who actually is on that taskforce team because I think that's gonna be critical in terms of making sure that you answer exactly the concerns of what the employees have. Paula: Fabulous, thank you. And that sort of leads us to, what are your goals? Making sure...I know it's not hard. It seems like it's a no brainer what they're doing when they're communicating out to employees, but I think it's really important that you make it clear because...I know we've all seen this. We've probably worked with one or two people who they'd rather wait and have all the answers before they communicate out. Or they'd rather...they want to reassure employees, but they're really making it look a lot prettier than it is. You've got the corporate speak. I saw that once in a company where they...it was a huge amount of layoffs and they were sending out messages about how great the restructure was. And the employees were absolutely livid because they had two jobs to do now and their best friends had left the company and the company wasn't acknowledging...they really hadn't acknowledged the reality of it. So, I don't know. Tell me what you think about that, Susan, what you've seen at this phase. Susan: I just think this is a real opportunity for organizations to be authentic. And yes, bad news sometimes does have to be imparted, and I actually think individuals can be very resilient. And as long as they know what they're dealing with, then they can start to make their own plans. Keeping people in the dark is just unfair, and I think it's...the more authentic and honest and upfront you can be, then the better that's gonna be in the long term. That just definitely builds trust. Paula: Fabulous, yeah. And framework. This is another piece we've talked about too, and it really applies to team and applies to goals but what we want to say here when we say establish a framework...even if you don't know exactly what the messages are that you're sending out or if it's, as you said, if they...a merger acquisition where you're not really clear yet on what the impact's gonna be, one of the first things you want to do is set up your communication path, a framework for communication, a framework for information going from the taskforce to the comms team. How are we gonna communicate with employees? [inaudible 00:14:56] if you're on the comms team, you don't necessarily have responsibility for what is changing, right? That's more with the change task force, I'm calling it. But you can set up a framework in a system so that you are across it. You can set all that up now, making sure that's really tight. And then on the other side, you can also set up your structure now for how are you planning to message your employees, how often, how are you gonna help them adopt change? A lot of that you can set up now, even if you don't have the actual decisions or messages to send out yet. Susan, do you have...I think you said that was a big piece of it, yeah? Susan: Yes, I think this is a key outtake from today's session, actually, in terms of this is something that we can start working on now. Whilst we might not have the answers for everything, at least get the framework in place. The last thing you want is sudden decisions are made and actually you haven't got this framework ready to go. But get the taskforce up and running, start to be...set some discipline in terms of when you're gonna be meeting and who's gonna be responsible for which actions. And then once those announcements start to come through, you'll be ready to kind of hit the ground running. Paula: Fantastic. Okay, and just moving along. I really want to get to some of the specifics around SnapComms as well, but a couple more points to tell you before we get there. And this one, this is all about just making sure...and Anne, I think you said it multiple times now, which is great, just knowing what concerns are at that level. [inaudible 00:16:46] four stages of change. This is something that you work with quite a lot in terms of aligning your messaging to the four stages of change people go through. Susan: Yeah, I mean, understanding that people transition through change at different levels. But, pretty much there's these four recognized stages, and I think try and match your communications to each of these stages. That first stage is into what they're...listen to what their concerns are, being supportive and open and direct. Second stage is that there's a lot of disruption and people want to know how it's gonna effect them. So, from an internal communications perspective, you can just make sure that staff know of what the implications of the change is gonna be. And again, that whole reassurance comes into play here. That definitely helps to mitigate rumors. That third stage, that's when individuals start to go into that exploration, you know, "Okay. Well, what are my options? This is gonna happen whether I like it or not. What else? What can I do to move forward?" And I think, from an employer's perspective, it's really important to try and encourage staff to think of new methods. Think of how their future could play out. So, work with staff to develop perhaps maybe new career paths or new areas within the business they could be working on. And finally, that stage four is that kind of rebuilding and the acceptance that change is happening. So, again, it's important to be open and transparent, and encourage feedback, encourage discussion and focus on the future and benefits. And that's critical because, of course, once change happens, often it can be for the better. So, emphasize that there is a way forward from this. Paula: Fantastic. Great. And then massage control. I'll go through these slides quite quickly because I just am cognizant of the time. We only have half an hour. But in terms of message control...I use the word control, but cautiously. The idea is that you do want to lead the dialogue, control the dialogue, get the message out from the company so that you're not responding, you're not having rumors or other people who aren't official spokespeople in your company or outside reporters leading the narrative on what's happening and then having to respond and try to come back from that. I know this is something that you said was critical as well. [inaudible 00:19:34]. Go ahead. Susan: No, I was just gonna say that, wherever possible, try and take the lead on...if you know there's a burning issue, it's much better to be on the front foot for that as opposed to suddenly on the collaboration platforms. Somebody might be posting something, and before you know, it's quickly kind of spiraled out of control with everyone chiming in with their own thoughts and opinions. Yes, you do want that feedback, but wherever possible, try and control the message in terms of how the organization wanted to go that's truer to what the reality is, as opposed to someone's [inaudible 00:20:15] opinion on something. Paula: Absolutely. And then, just to round it up in terms of how you want to handle major change, a campaign approach where you have specific vehicles for your communications, you schedule it out, you have some consistency for employees. That's really...again, we're back to framework too. You can set this up ahead of time and just have everything ready to go. And you're not just doing one-offs, you're looking at what you're communicating over time around the issue. And lastly, now we're gonna get into some of the SnapComms pieces more specifically. You want to align your delivery of your messages. So now we're getting into some of the nitty-gritty. When you have something so important, all this change after...I'm gonna say merger, acquisition again because I know that's one of the scenarios people are looking at on this call. How do you want to communicate? Do you want to put that out in an email? Does email work? How many of your people are you gonna reach? How long will it take? What would be ideal for you? What percentage of your audience do you want to reach over the next three days with this particular message that's going out? If there's action that they have to take. Maybe you want them to take a survey, maybe there's actually a behavior change or a systems change that's happening. When does that have to happen and how sure do you have to be that everybody gets it and has made that change? These are the kind of questions you want to ask when you look at "Okay, how am I gonna send this out? Is it gonna be a text message to my people in the field, or am I gonna put it up on the internet, mention it in the manager meeting?" Our tools, as most of you know, are all about push messaging, visual messaging that will cut through. We're not gonna have one thing in the inbox or something on Yammer or a social media channel that maybe 10% of people really are power users of. We can give you the ability to reach everybody. And I've got a list here of some of the message types we have and how they might be used. And that's where we're gonna go now. We're gonna have a look at specific examples, and this should give you ideas for any kind of major change, how you might use some of these tools that we have. So let's get into that. And I told you this slide was coming back, and it has, so let's look at phase one right now for something like Brexit. Say you're a UK or a European company, and you've already done some of this, of course, but let's have a look at what you want to do right now when Brexit's gonna happen. We have no idea when. We really don't know what the new rules are gonna be. So, probably what you want to do, is you want to let employees know what the company's doing and reassure them, make sure they're engaged, build up that trust, and then maybe give them a place where they can submit their feedback or suggestions or have a discussion or just vent or just ask about whatever's worrying them. So what we say is, most companies, they're gonna be putting up some sort of resource on their intranet on confluence, on an internal...make an internal resource for employees. And what you can do here is use, for example, our ticker scroll. I'm gonna use our ticker as an example. It's a great way to drive people there, to ensure that when you launch this kind of a site, everyone knows about it immediately. And I'll pull up the actual ticker on my screen here, and hopefully you can see this. I'm sure it's pretty tiny when you're looking at my screen remotely. But here we have a ticker that says, "What does it mean for your company? How likely is it to affect you?" And we have a link. We can click through to the intranet. So, if you imagine you could launch this 2 p.m. Eastern Time on a Wednesday, and by the end of the week you could have everyone clicking through. You can track, of course, with our software too. You can see exactly what percentage of your audience has seen your message or not. So, a great way to launch something that would be as important as a resource for your employees. So that's a cut through type message where you're gonna put something up visually on your employee's screen. It's got to be something important enough that it merits an interruption, of course. But it's dynamic, it's branded, it really is showcased above all the normal channels for messaging that you have. And then another type of messaging, visual messaging software we have is screensavers/wallpaper. And this is subtler, right? This is something where you want to get a message across over time to your audience and we're not going to interrupt them. It's gonna come up. They've gone to get a cup of coffee and their screensaver comes on. Then they'll see it. Or if they pass their desktop, they'll see it. So, this could be a good way to put something up. And here's the screensaver slide example. Very simple, but have this as one slide, one item cycling in your screensaver content. And here, this is an example of a desktop background, a wallpaper, if you will. This is a wallpaper. And yep, that is another way that you can just reinforce those messages as they go through their day. They can see that and just become more familiar with those kind of items. And Susan, did you have other suggestions? Susan: Yeah, no. I just [inaudible 00:26:18]. A lot of our customers get great results from their screensavers just because they are useful for reinforcing key messages on an ongoing basis. So, for example, if there's a major change announcement and the CEO does an all staff meeting, not everybody can attend those presentations, for example, or sometimes some of the key messages are just missed, quite honestly. So it's really great to use the screensavers just to reiterate and reinforce what the CEO, the senior management is trying to communicate. Paula: I love that idea. That's a great idea. Great idea to pull those messages out and anybody who...not have them have to go find the webinar or find the podcast. Susan: Yeah, there's no excuses then. Paula: Yeah, yeah. Just have the main points up. Fantastic. Okay, so now let's say Brexit...Britain's made the announcement. They've started to negotiate with the EU and we know what's coming down the pipeline. All right, something's happening, we want to tell employees. Here's what we've set up in terms of taskforce, here's what we're probably gonna be doing over the next year, two years. Susan: Yeah, no, we can. Paula: Oh, you could? Okay. This is an actual CEO for a UK company, and I found this on YouTube. It just was a perfect example where he's gone out and he's talked about what employees think about what's happening. And we've seen this before with video that...actually, we had a really big grocery store chain in the U.S. that used our video alert to get a key video out to employees, and something that would've gone on their intranet and have maybe 500 views. They put it out this way and they had essentially all 6,000 people seeing it within two days. You figure out how you're gonna visually display it, when you're gonna have it come up. But they were able to get that penetration that was really critical for them so much quickly, so much more quickly. That's another idea for you with some of this major change. If you have something like that, that you want to make sure everybody knows. I'll close that one and then show you the next one, which has conveniently come up. And this is an engagement survey, so let's...you probably want to find out how are people...how are they doing, how are they feeling about this, what's the vibe like. Whatever kind of information you want to capture when it comes to major change. You can, of course, use our popup survey tool which is something I've just put on screen. And you'll see there's a lot of animation on this one. This one has animation built in. Simply example. Ask a few questions, tick box questions or open-ended questions, and get a...you can even send out something like this, an engagement survey, to a subset of your employees. Send it out to 20% of your employees. You'll get 15% responding out of the 20, and you'll get a statistically relevant response back. You can send it to the entire company or just to a portion of the company and do it quite often in order to get the information back that you want. And I didn't mean to click bad words here. Okay, I'll close that. And Susan, any sort of thoughts on that? Susan: Actually, no, I haven't. Susan: I'm just cognizant of time because we're running out of time. Paula: Very good. So let's go one step further. When you get to the time, when you get to that phase where it's really all about execution, it's all about making sure people know what they have to do differently, when these things are happening. So now it's less about making sure they're engaged, happy, keeping morale up, now we're really into, "Okay, we've got that system cutover [SP] happening," or "On this date, we have to start using a different process for whatever we're doing." So with that, some of our tools are equally good for that. We have what we call a countdown screensaver. Let me just pull this one up. You can send a ticker. We see people sending out tickers as reminders, you know, "We have a live call. This is the last call we're having to answer any of your questions. We want to make sure everyone's clear on what they have to do come Monday." You can use our cut through tools to make sure you get maximum attendance for things like that. And you can send out popup quizzes too and test their knowledge, do a little bit of a short three, four question knowledge check, put in hyperlinks. I know I'm describing a lot of this but I think it's a little bit faster with our time running out. But you can do a knowledge check quiz and get a sense of how people are doing when it comes to what you think they really need to know how to do. And then countdown screensaver, this one's really effective. And I know, Susan, you had a couple of comments. You've seen this one work quite well before. Susan: This has been really powerful if there is an actual cutover date for something specific. So, for example, the renaming of drugs to place fairly recently that a lot of hostels and medical centers actually did a countdown. And there was no doubt in employees' minds as to what date the new naming conventions came into place. Paula: Very good, yeah. The countdown screensaver too, you have the screen that has the countdown clock counting to whatever date you want it to go to. And then once that date is reached, you have a different screen that automatically appears, saying, "Hey, we're here now. Don't forget." So there's a before and after part to the visual that you get out there. So that's really what we wanted to go through today in terms of major change. Some of the major elements that you need when you're working on a project like this and then how do some of these SnapComms tools that we have, how can they really help you achieve your goals when it comes to the communication. Let's have a look. Are there any questions before we wrap up? I have a few resources for anyone interested in Brexit. We have a few resources there, and we're gonna include a few resources on major change too that we've published, some infographics and items that might be helpful. But any other questions that we can answer from people? While you're thinking about your questions, I just want to answer Maryanne's [SP] question. So Maryanne, I'm gonna read this out loud, if you don't mind. She says, "We send IT alerts to our business partners at partner clubs outside of our internal company. How can we use this alerting system to send out alerts to those partner clubs, without publishing the Snap client to them?" So, with our software, there's the SnapComms clients that will run in the background, and that's what handles downloading the messages and visually displaying them on the machine. So, Maryanne, there are a couple of ways. We have a mobile solution that can get SMS out to people, and we also have a web client where you could actually publish to a portal or publish to a web page. So if they're accessing information from you on a website, we can also publish to something like that. Yeah, so there's a couple of ways to do it, and we'll follow up with you after this meeting to talk more about that specific area. And if anyone wants some of these examples or have any specific questions about their major change initiatives, please let us know. I don't see any more questions coming in. And Susan, thank you so much. Do you have anything to add before we wrap it up? Susan: No, I think that's just been awesome. Thank you so much, Paula. Just to really get established with that framework, that's my key message to listeners today, and get your taskforce appointed. Start to think about the best channels to get that message cut through. It's not gonna be just one. People absorb information in different ways, so I think that's really important to make sure that you cater for a wide demographic in terms of communicating change, because the last thing we want is misunderstanding or missed information. So look at what different tools are available, and use them all. Use them all. Paula: Fantastic, yeah. Absolutely. And listen, thank you all so much. We'll be sending you a link to our recording and also a download link for the slides. So we'll send you those, and have a great day. Thanks so much and best of luck with your major change initiatives. Okay, take care, everyone. Bye-bye.